NB: This article is based on an original article from Champion Bets. You can view that here. While products like ‘Best Tote / SP’ are derived from the traditional Australian totes, both Betfair and TopBetta offer products which are either their own ecosystem or derived from a different pool. So which is the best WIN OPTION to use for your betting at the present time (Jan 2018)? • Betfair SP – taking into account commission rates that are paid on profits (10% for NSW thoroughbred racing, 6% for Victoria). • GOAT SP – this is TopBetta's derivative of The Global Tote. It pays at the higher of Global Tote or official SP. • Top Fluc – while not a tote product in the truest sense, the data was available and the bet type is widely available corporate bookies (provided you bet more than 30 minutes before the race). So there you have it: in both states, TopBetta's GOAT SP reigns supreme. It delivered significantly better profits than Betfair SP, which in turn was superior to both Top Fluc and Best Tote/SP. Some races can throw up some massive overlays with GOAT SP! Great if you snag the winner. There are nine races where outsiders won. Looking at these, it’s pretty clear that both Betfair SP and the Global Tote can produce some extremely large numbers in these instances that can skew the overall figures when using level staking (as we are in this example). Even discarding the exceptional overlays on long-shots, the GOAT SP is the best product based on our analysis. Combine it with RewardBet (which features GOAT SP exclusively at the moment) then you are well ahead of the pack! NB: The difference in NSW is the 10% commission rate on Betfair SP, compared to 6% in Victoria. 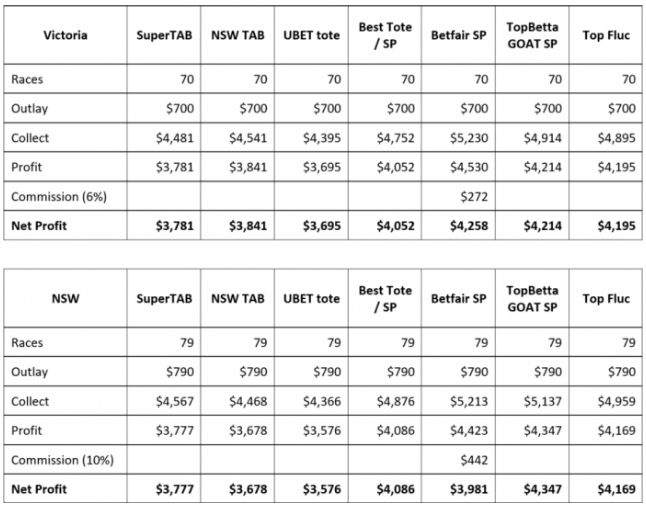 For NSW Racing, GOAT SP is a far better proposition than Betfair SP, which also lags behind even Best Tote / SP and Top Fluc … the higher fees have really damaged the Betfair exchange product when it comes to NSW. All-in-all? Based on our sample, the GOAT SP is the way to go. It’s still a developing product, but at the moment it is King of the Totes and RewardBet customers have access to it!